The Apollo School in Helsinki used Maptionnaire to have high school students try out online participatory mapping as part of their geo-media class. In this advanced geography course, pupils train their geographical thinking, learn how to analyze their surroundings using a variety of methods, and how to interpret the data they gather. 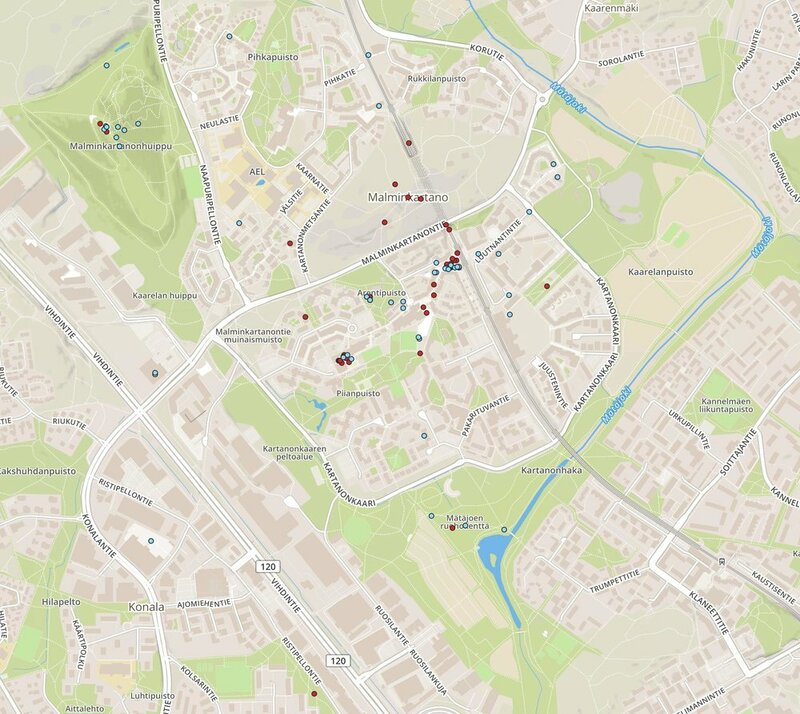 The class designed a map survey to ask younger students of the school (7-9 graders) about their opinions on the most enjoyable places in Malminkartano as well as where they think actions for improvement are most badly needed. The respondents were also asked to describe what they think is best in Malminkartano and how the neighborhood could be developed as a whole. The high school students created their project on the basis of a similar Maptionnaire survey done by the city of Helsinki in the neighborhood in 2016. In their analyses, the high school students found that the younger students especially enjoy the beautiful landscapes around the adjacent artificial hill, the grass fields by a nearby creek, Piianpuisto park, as well as the school’s own yard. The neighborhood’s central square by the train station, on the other hand, raised mixed feelings. According to the results, the younger students go there to meet friends and visit the library and shops. But the younger students also consider the square to be an unpleasant area due to intoxicated people they meet there. The youngsters envisioned to upgrade the “Dump Hill” by adding events, a changing room, an equipment rental outlet, a ski lift, and artificial grass. Moreover, the respondents wished there were more clean and safe places to hang out in the neighborhood. The respondents also gave advice for potential restauranteurs: There’s demand for a chicken restaurant in the neighborhood. The experiences of using Maptionnaire in Apollo School’s geo-media class were positive and underline how the tool can benefit educational programs. Apollo School’s 7-9 graders’ view of Malminkartano. Enjoyable places are marked with blue and unpleasant ones with red.